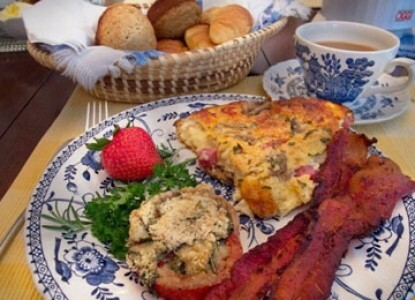 Enjoy a full, hot gourmet breakfast. 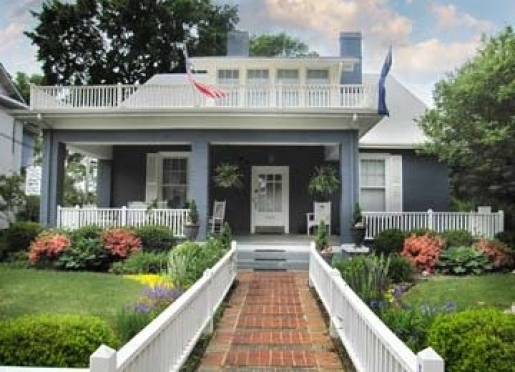 East Main Guest House Bed & Breakfast Inn is located in the Historic District, just a few blocks from the heart of Rock Hill, South Carolina, Home of Christmasville. USA. Hospitality, comfort and beauty awaits you at EMGH and a quiet stroll takes you to fine restaurants, pubs, concerts, festivals, theater, museums, shops, galleries and gardens. 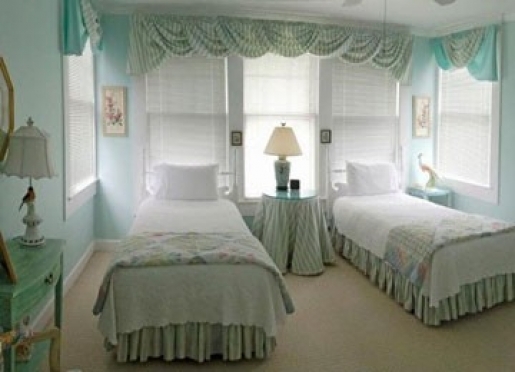 This B&B has operated continuously since May, 1991 when the transformation of the 1916 Craftsman Bungalow into a tasteful blend of art, antiques and color was completed. The renovation won Historic Rock Hill's prestigious Renovation Award and continues to win compliments from guests who visit here from every State and across the world..
After more than twenty-five years as a mainstay in Old Town Rock Hill, EMGH has watched downtown grow and progress. Guests have come back again and again and enjoy the changes. One thing they also love is that EMGH has not changed, only improved. During those 25 years, this magnificent house has been featured on two national Reality TV shows and several television commercials and Journal pieces, It has also been on Tour of Home events for the Junior Womens Club, Rock Hill Music Society and Christmasville, USA. as well as the site of Weddings, Bridal Luncheons, Receptions and Parties for a myriad of occasions. AND WE LOOK FORWARD TO SHARING IT WITH YOU!. 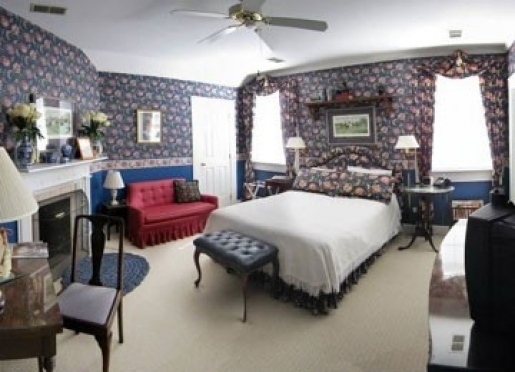 Come, stay and savor the friendly atmosphere and home town elegance of this unique Bed and Breakfast. 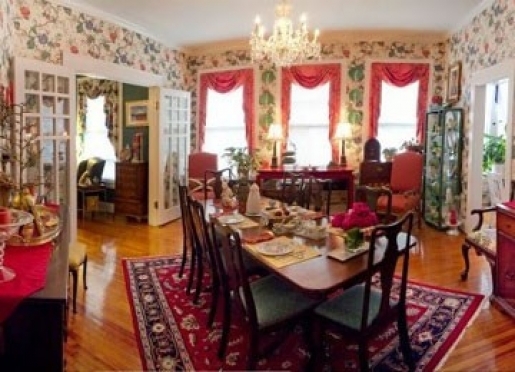 The spacious dining room features a table that comfortably seats 10 and is brimming with flowers, candles and good food. Our guests enjoy the bright and cheerful ambiance of this beautiful room and the full, hot gourmet breakfast served from 7:30 - 9:30 each day along with coffee, tea, homebaked muffins, croissants, juices and fresh fruit. Breakfast can be served on the terrace or beneath the pergola beside the gurgling fountain. Weather permitting and with prior notice, of course. 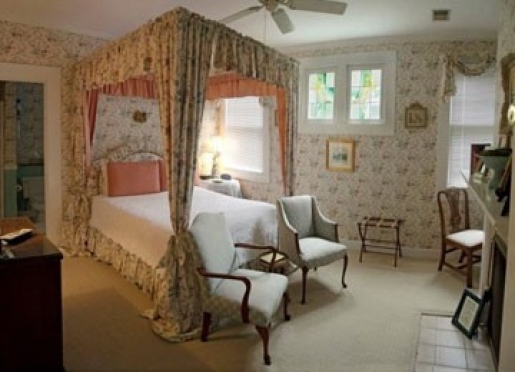 The Honeymoon Suite, East Room, Garden Room, and our new Downstairs Room await your visit. Like us on Facebook and see more photos of this beautiful property. A portion of the beautiful back gardens. 1 hour to Columbia, S.C.
Travelers are always looking for memorable and relaxing experiences. Let’s discover more through the words of our innkeepers. Many thanks to Melba Peterson for sharing her own secrets with BBOnline.com! Location, location,location. Just blocks from a growing and vital downtown, and all the wonderful compliments we have received on Trip Advisor are the reasons people want to try out our inn. But they come back because they are never disappointed in their experience with us. "The breakfasts are delicious, filling and served with just enough flair. "is what guests say about EMGH. We love being on Main Street so close to the vital town center. We love the gardens, the brick walks and collection of plants and huge trees. Although in the heart of the town, it is secluded in the back gardens which are a sanctuary for Cardinals, Robins and Doves as well as busy squirrels. There are several places to sit and enjoy the ambience while strolling there.. We love sitting in the rocking chairs on the huge front porch too, and watching the world go by. But most of all, we love sharing these pleasures with our wonderful guests. Guests relate their impressions of EMGH: " Comfortable but elegant, and not in the least stuffy. All the bed rooms are large and well furnished, the beds are comfortable, and the private bathrooms are ultra clean, efficient, and well lighted. What more could you want?" What guests enjoy most seems to be: " Conversations with interesting and delightful fellow guests as well as the innkeeper add to the experience. The house is well furnished throughout and books and bookshelves abound. Outdoors, beautiful walks and gardens and large front porch are surprise attractions making the place even more enjoyable. And all at a tremendous value! 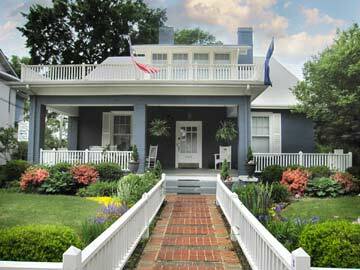 East Main Guest House is what a B&B should be!" Rock Hill is a twenty first century city that honors its past. Until recently, Rock Hill and EMGH was a stop-over for folks mostly from Ohio, Michigan and Western Pennsylvania on their way to Florida, Low Country South Carolina or Savannah, and often on their way back home again. Some have been staying here for many years. Today, folks from all over the world find us on BBOnline, fly into Charlotte Airport and make their way to EMGH, a drive of only 25 minutes. There they are graciously received at a friendly, safe and restful place. 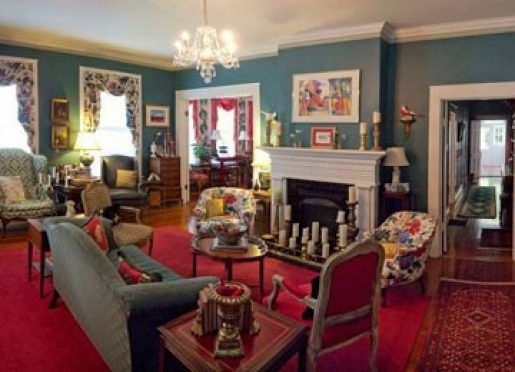 East Main Guest House has become The Place to stay because Old Town Rock Hill has become a destination itself. It is only a few short blocks to restaurants, museums, gardens, art galleries and the fabulous new Fountain Park, which features a state of the art Fountain that shoots 40 feet into the air and does a myriad of different configurations controlled by computers. Our guests are very impressed. Just 3 blocks away is the White Home, circa 1830. Owned and lived in by the same family until the 1990's when Historic Rock Hill, private citizens and the city of Rock Hill collaborated on an exquisite renovation. It is now a wedding venue, an Historic Tour home and Historic Rock Hill offices. There are many other venues in the Rock Hill area such as Brattonsville, a Revolutionary era site and at the other end of the spectrum, the very modern, state of the art BMX Velodrome, a bicycle racing course. The whole town center called "Old Town Rock Hill". A quiet stroll takes guests to our newest restaurant call Flip Side. It is wonderful. Better than anything in Charlotte, we think. We are so happy to have them on Caldwell Street, downtown. They feature side dishes such as roasted Brussell Sprouts with Balsamic Glaze, and Carolina grits. Main Dishes include Pan Roasted Salmon with Sweet corn Puree, tomatoes and fennel and Skillet roasted Shrimp and grits. On Sundays there is the Brunch menu which features such delights as Main Lobster Omelets or their own version of Eggs Benedict called "Benne! Benne!. If you could possibly hold more after eating the delicious breakfasts that are served at EMGH! Just a few doors away from Flip Side is Amelie's, a French bakery and restaurant. The coffee is wonderful and the pastries, sublime. They are widely known as one of the top thirty best bakeries in the World! I personally have not tried the others so we place Amelie's as Number One, no contest. Another unique Restaurant is Millstone Pizza. Wonderful salads and Gourmet Pizza cooked in wood fired ovens....and over 100 beers. If you are looking for quaint ambiance and good food, you will love the renovation of the old building and artwork featured there. "The Pizza ain't too shabby either"!! There is only in old town.com. We have had rave reviews from our guests on all the above places. People also love visiting with Bob at the Pottery Place located in the Getty's Building. This historic building was the Federal Court House and Post Office for many years and is now home to Pottery galleries and production areas. On Sundays, a church meets upstairs in the old and wonderfully intact Courtroom, but it is open for viewing other days. Also located in this building is a cottage industry which is known throughout the states for its fabrication of Bow Ties. They have a thriving internet business and are made in an upstairs suite in this wonderful vintage building. Shopping at these places is encouraged as well as the Overhead Station, a quaint and interesting gift shop just across Main Street in the same block. Other shops, the Children's Museum, Art Gallery and several other restaurants like McHales Irish Pub and the Five&Dine make Old Town Rock Hill a vital and interesting place to visit, and it is growing with new areas planned. East Main Guest House is growing too, we have found it necessary to add a fourth room. 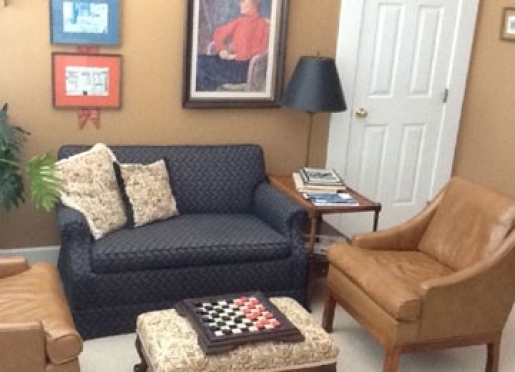 This one is on the main level and has a queen sized bed with an adjoining private bath. So when you plan your next trip to Rock Hill on business, pleasure, family or just passing through, there are a myriad of things to do, see, and enjoy in Old Town Rock Hill, as well as EMGH.